There is something very satisfying about redesign projects. 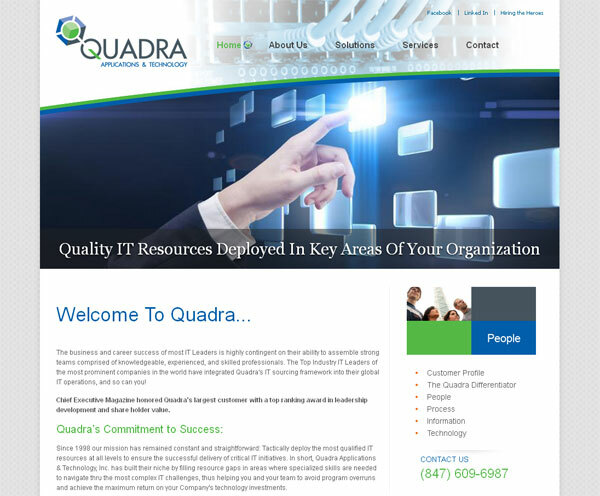 We were contacted recently by Chicago based Quadra Applications & Technology, who were looking for a new logo design. They already had a new website in the works and felt the time was right for a revamp of their identity- their main request was something that looked more professional. In redesigning a logo it is not uncommon to work from some element of the old logo, whether it be the color palette, style of font or icon. In the case of Quadra we adopted the cube of their original logo, reworking it to encompass a sphere and connective framework. Teamed with a modern open typeface the new logo is much more fitting for the IT market they serve. This entry was posted in Before and After, Chicago Branding, Chicago Graphic Design, Chicago Logo Designer, Logo Work and tagged Logo Design. Bookmark the permalink.